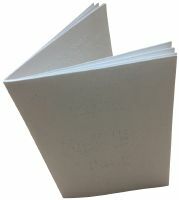 Include Braille Rules on How to Play Nine Men's Morris for $5.00? A challenging ancient strategy game. Game's theme is to make as many lines as you can. Comes with a wooden box to store the board and men. 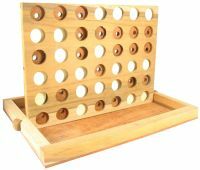 A dot on the white pegs makes this a great tactile game. Nine Men's Morris, also called Merrelles, is one of the world's most ancient games. Your goal is to make as many lines as you can, all the while trying to prevent your opponent from doing the same. You see, whenever either player is allowed to place three of his men in a line, he has made a mill. And every time a player makes a mill, he takes one of his opponent's men. Play continues until one player is unable to move any of his men, or has only two men left. In either case, that player is unable to make a new mill, and he loses the game. 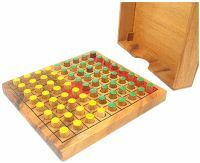 As always, our version of this classic game comes with a wooden box to store the board and men in. There's also a dot on the white pegs, so blind players will know which men belong to what team. So, if you're good at strategic games and enjoy a challenge, you'll like Nine Men's Morris as much as the Egyptians did over three thousand years ago. For ages 8 and up. Introduction. This historic strategy game has a very familiar ring: three in a row. Nine Men's Morris can be described as Tic-tac-toe taken to the next level. It's an excellent game for enhancing logic and problem solving skills! History. 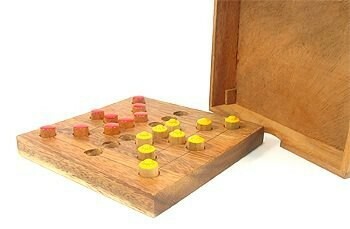 Nine Men's Morris, or Mill, is one of the oldest board games known. The board pattern has been found on ancient Egyptian roofing tiles, Roman and Greek buildings, an English wall dating from 1200, and even choir stalls in old English cathedrals. The game has been and continues to be popular in many countries. It is the best of the so-called row-of-three games, the simplest of which is, of course, Tic-Tac-Toe. Placing. 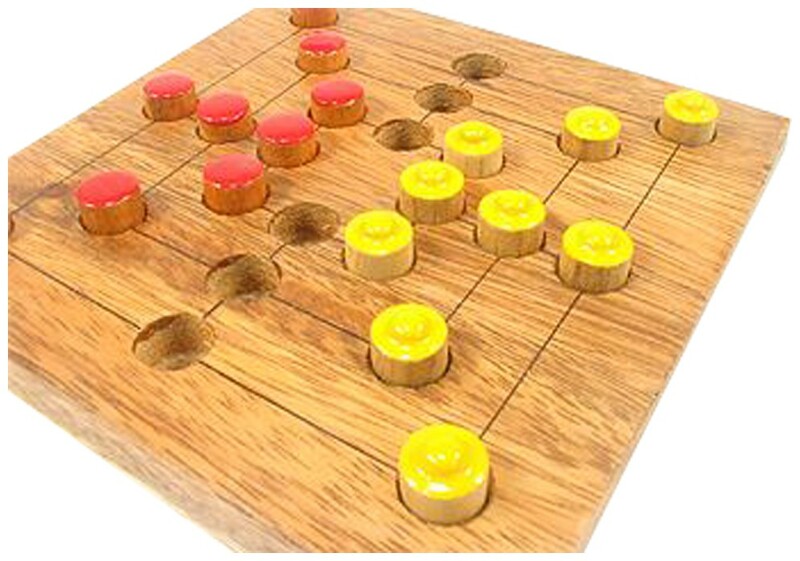 The board begins empty, and the two players each use nine pegs of their own color. Our playing pieces have a tactile dot on one set of pegs. The players take turns placing one peg at a time in any hole on the board. The objective is to get three pegs of one's own color in a line on any three adjoining spots, vertically or horizontally. The three diagonal spots on each side do not count as a row. Capturing. 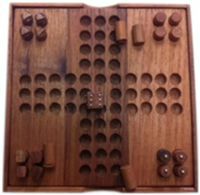 Whenever a player forms a row of three, called a "Mill," that player removes one of the opponent's pegs from the board. A peg may not be taken from an existing Mill unless there is no other option. Moving. Once all the pegs have been placed, the players take turns moving one of their pegs to an adjacent open spot. Anytime a player manages to close a Mill (form a row of three), the player removes an opponent's peg. A Mill which is opened and then closed again on a later turn is considered a new row. Players may not pass a turn; a peg must be moved, even if it is to the player's disadvantage. Jumping. When one player has only 3 pegs left on the board, that player may jump to any open spot on the board, instead of moving to an adjacent spot. This freedom gives the player greater mobility to block the other player from forming a Mill. Winning. The player who first is reduced to only two pegs remaining, or who cannot move any peg on the board, loses the game. Strategy. Blocking the opponent from getting three in a row by placing a peg in the opponent's line is the most direct approach. Forming combinations where you can get a Mill in two different directions such that your opponent can block only one of them is a little more subtle. And maneuvering to block in all of the opponent's pieces is the most devious way to win. Remember, the most powerful spots are in the middle of the board, because they are the entry points for moving to the inner or outer holes.